At Mayapur Institute we understand providing conducive accommodation is essential in helping you settle in and enjoy your time with us whilst you undergo sastric study. Mayapur Institute (MI) is happy to announce the launch of accommodation facility for Gents from this year (2017) at our ongoing Campus. MI campus is located in a beautiful landscape and lush green surroundings on Taranpur Road and is within 12 minutes distance from the main temple. At MI Campus, we provide pleasant, comfortable and fully vastu-compliant accommodation for our students who have enrolled with us and come to Sridham Mayapur to study Srila Prabhupada’s books. Accommodation facility is located within the Campus, where the classes will be conducted from this year. The rooms are spacious measuring upto 320 sqft with two doors and windows providing ample natural light and ventilation. There is enough balcony space with wide corridors around all the rooms that prevents the rooms getting directly exposed to the sunlight and provides opportunity for japa walk. The Veranda also facilitates sunbath during winter. These accommodations are very safe, quiet, have a serene atmosphere around and are ideal for focused study. The rooms are well furnished with two chairs and tables for studying purpose and 2 beds, ideal for two students to share. Each room has cupboard/ shelves to keep your belongings with dressing area. Also, it has attached bathroom with WC, hot water facility and shower. Residing at MI campus offers you a sublime and serene environment conducive to learning. Our hostels and student facilities are conveniently located within an easy walk to the temple. When you live at campus, you can avoid walking long distances and spend quality time associating with fellow devotees and teachers who help you in your sastric study and thereby enrich your experience of studying scriptures at holy dham. Filled with fun, friendly and with a healthy dose of independence, living at MI Campus is a great way to fully immerse yourself in the study of scriptures from your very first day. As an introductory offer, each rooms are available at an unbelievable price of just Rs. 300 per day per room, which can be shared between 2 students depending on the availability of students to share. During Gaura Purnima Festival (Feb – 10th Mar 2020) time, the charges will be Rs. 500 per day per room, which can be shared between 2 students depending on the availability of students to share. At MI Campus, we also provide Prasadam (Breakfast, Lunch and Dinner) to our students at a subsidized and affordable rates. You will have to buy coupon in advance, or speak to Bh. Damodar. Important Note : Please note Accomodation and Prasadam charges are not refundable and not adjustable. There is a wide range of accommodation available in Mayapur that can be booked directly through the Mayapur Guest House (Please visit http://www.visitmayapur.com ) or Shruti Bhawan or Vaishnava Academy. Accommodation ranges from shared dormitories to AC on-suite rooms. Please see their sites for contact details and current rates. By special arrangement we are able to offer discounted accommodation to our students at Sruti Bhavan, previously known as the Youth Forum. 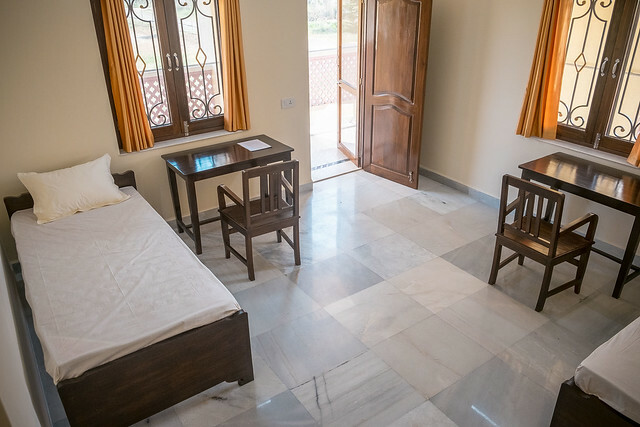 The accommodation is simple but comfortable, and located in a quiet area within the ISKCON campus, adjacent to the Vaisnava Academy and goshala. For Shruti Bhawan, Contact, Tarun Gaura Das, +91 6295 711752. The building has separate floors for men and women, with common bathrooms on each floor. The rooms are bright with two beds, ideal for two students to share. If you are going to stay on in Mayapur for the Gaura Purnima Festival, you will need to make your own arrangements for accommodation. Discounted rates do not apply during festival periods. You can find out more about festival bookings directly through the MGHB – http://www.visitmayapur.com.